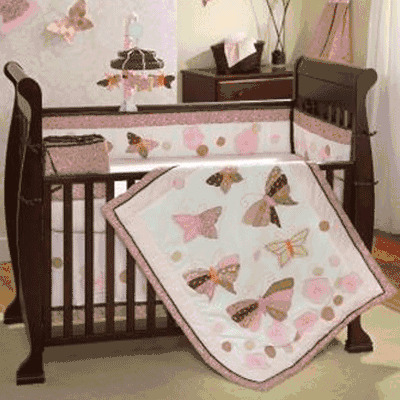 The Butterfly Dreams 6 Piece set includes: quilt, 4-piece bumper, dust ruffle, fitted sheet, window valance and diaper stacker. The comforter measures 35" x 43.5". The 4-piece bumper is 9.5" H x 154" L. The short sides are 9.5" x 27", and the long sides 9.5" x 50". The dust ruffle has a 14.5" drop, and the fitted sheet is designed to fit a standard size, 28" x 52" crib mattress. The window valance is 60" across with a 15" drop, including a 3" valance rod pocket. The diaper stacker is 11" x 21", and 8" deep. The quilt and bumper fronts, the dust ruffle drop and window valance are made of 70% polyester and 30% cotton. The quilt and bumper backs, and the fitted sheet are made of 100% cotton. The diaper stacker is 90% cotton and 10% polyester. 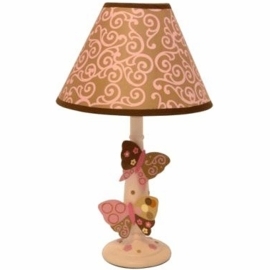 Fabric content is exclusive of decoration. Filling is 100% polyester fiber. Care instructions: machine wash cold separately in gentle cycle, do NOT bleach, tumble dry low, iron on lowest setting as needed. I recommend this crib set. 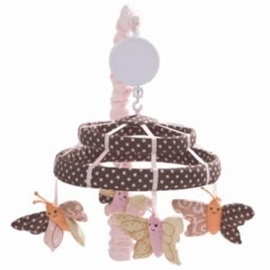 I bought it for my new born baby girl and I like it very much. Its very nice and comfortable.